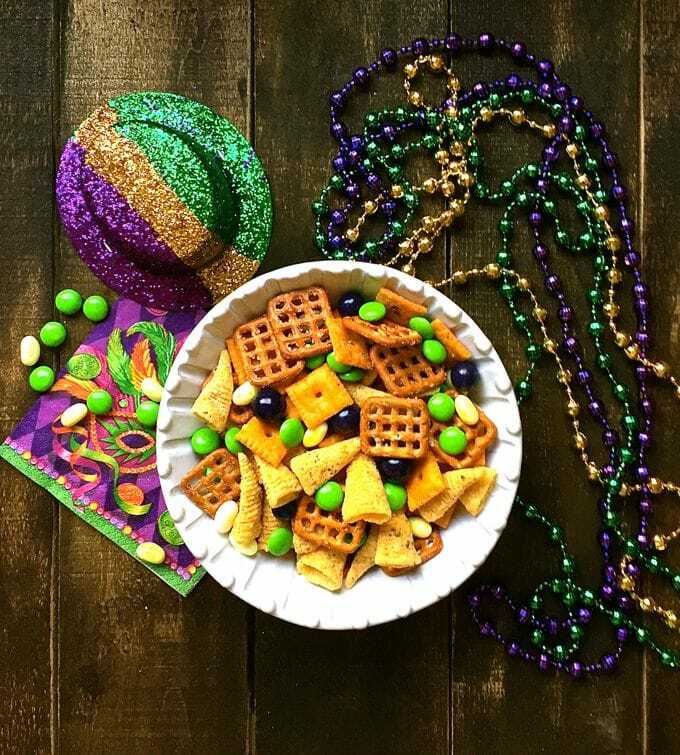 Mardi Gras is in full swing right now and I thought it would be fun to make a yummy snack mix full of Mardi Gras colors, which are green, purple and gold (yellow) and serve it at a book club meeting I was hosting. For inspiration, I turned to my sister Chula’s blog, Pudge Factor, because it’s full of great Mardi Gras recipes. She has them all: Shrimp Étouffée, New Orleans’ Beignets, the ultimate Mardi Gras confection King Cake and, of course, a Mardi Gras Munch. In fact, if you are looking for Mardi Gras recipes she has a round-up of 20 Tantalizing Mardi Gras Recipes featuring these recipes, a few of mine and more! Check it out! I wanted my Mardi Gras Snack Mix to be three things, simple to make, full of delicious things that my husband and I like to snack on, and festive. And, I think I checked all of the boxes with this fun and tasty, sweet and savory treat. I hope I will inspire you to whip up a batch today with your favorite treats just in time for the weekend! The most fun thing about this recipe is that you can really add whatever ingredients you like. Chula used two different kinds of cereal and pretzels, but I already had a big box of Cheezits and I decided to add Bugles. 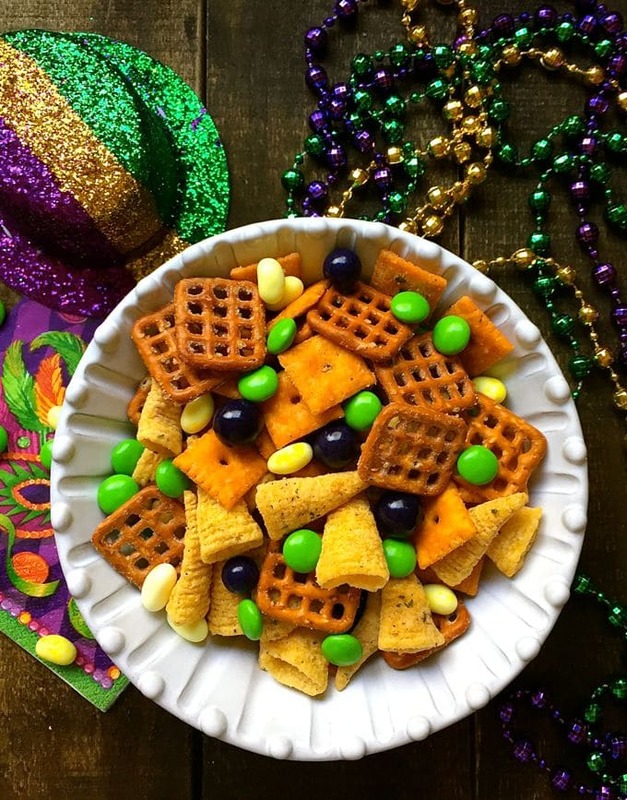 But what differentiates Mardi Gras Snack Mix from regular snack mix is adding the traditional festive Mardi Gras colors: purple, green and gold (yellow). Purple represents justice; green represents faith, and gold represents power. 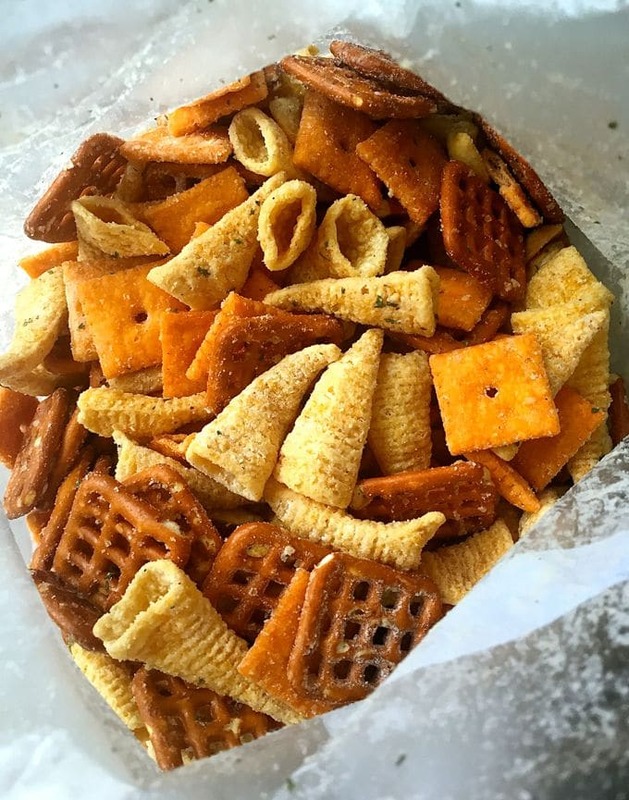 The other great thing about making this snack mix is that there is no cooking involved. You just throw everything in a bowl, mix it up, and you are done! How great is that? Want to change up this recipe and use it for another holiday, special occasion or a different theme? Just change up the candy colors. For a Christmas Snack Mix, use red and green candy, for the Fourth of July, how about red, white and blue candy, and for a great game day snack mix, how about using candies with your team’s colors? If you are looking for other Mardi Gras food ideas, check out my recipes for Mardi Gras Hurricane Cocktails, Chicken and Sausage Jambalaya, Easy Mardi Gras Hot Muffuletta Dip and my Mardi Gras recipe roundup: Ten Classic Mardi Gras Recipes. 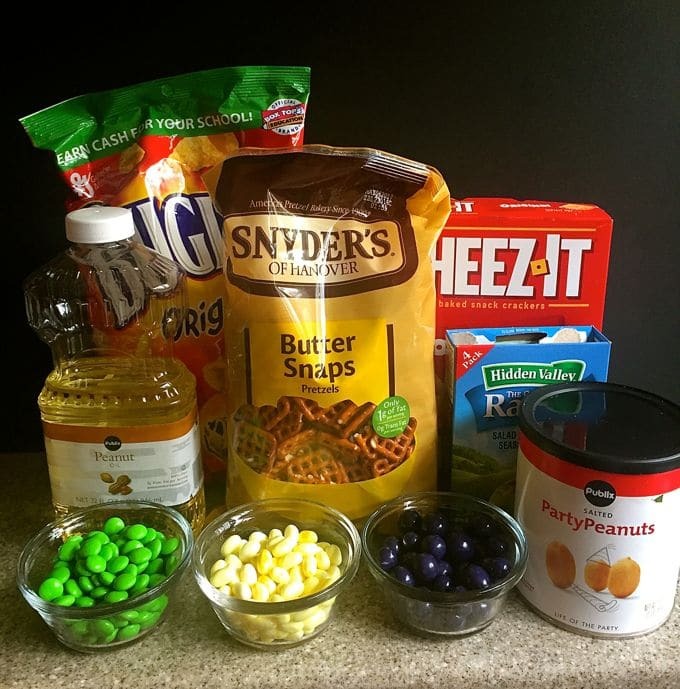 The ingredients I used to make my Mardi Gras Snack Mix include Cheezits, Bugles, small pretzels, and peanuts. You will also need vegetable oil and a package of dry Ranch Salad Dressing Mix. I also added green M&Ms, purple chocolate covered blueberries, and yellow jelly beans. 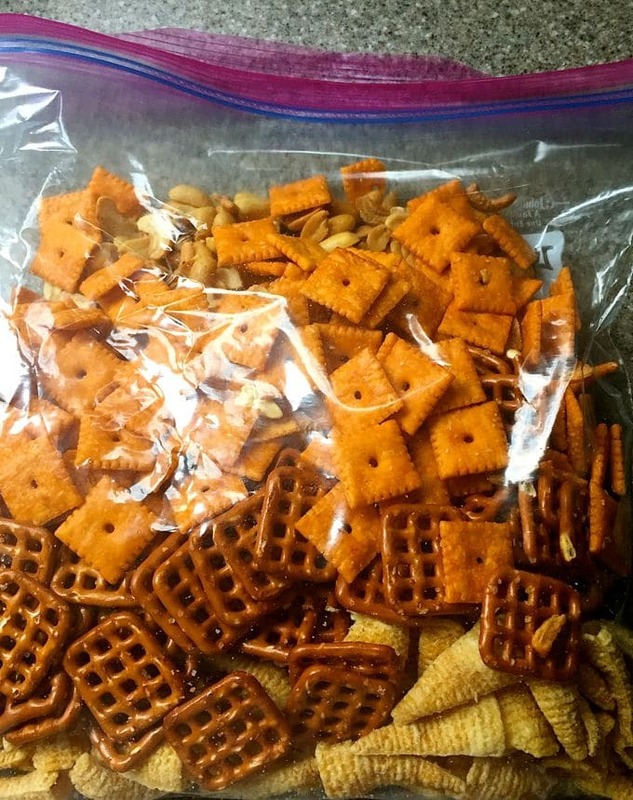 Combine the Cheezits, Bugles, pretzels and peanuts in a gallon size plastic bag and drizzle with the vegetable oil. Seal the bag and toss gently to coat the mixture. Add the contents of the Ranch dressing packet and toss gently again to evenly coat the mixture. When you are ready to serve, pour the mixture into a large bowl and top with the candy. 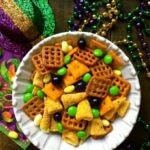 Mardi Gras Snack Mix is simple and fun to make, full of delicious sweet and savory treats and very festive with the traditional colors of Mardi Gras which are purple, green and yellow or gold. 2 cups assorted candies M&Ms, jelly beans, etc. Seal the bag and toss gently to coat the mixture. Add the Ranch dressing and toss gently again to evenly coat the mixture.